PUPPY UPDATE DEC 2017: Please take a look at our second gallery! We can also be found on Facebook. Look for Lene Shila Hedengran! 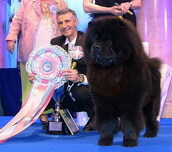 Our Long Feng Capain Jack Sparrow won at a Gala Show in Stockholm at Grand Hotel where all BIS puppies from 2012 were invited.